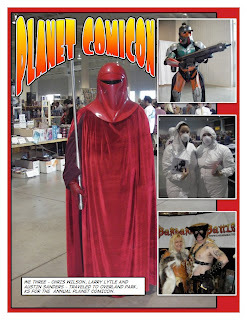 You are dying, no doubt, to hear of my adventures at Planet Comicon comic book convention in Overland Park, Kansas this weekend. It went just as expected. I met several comic book creators and talked with lots of hard-core fans who know more about comics and the industry than I will ever know. Of course there were plenty of vendors with comics, toys and whatnot to pilfer through. That is an adventure in and of itself, especially if the comics are not categorized or alphabetized. Plenty of the cheap comics are just boxes and boxes, lined up on tables, with all manner of comic goodness inside. It can take hours to make it through them all. I don’t have that kind of patience, but there are plenty who do and they walk away with arms loaded. I spent my time doing research. I left my friend, Larry, and my cousin, Austin, to their own devices and headed for the creator corner. There I found a nice mix of artists and writers who were all too happy to discuss their works (and the works of others) with anyone who took the time. I especially enjoyed talking with David Petersen, writer and illustrator of the acclaimed book MOUSE GUARD. He was working on some illustrations (inking) while we talked. Those illustrations were for sale as was some of the original art for MOUSE GUARD. I was tempted to buy some of the original art from the book, but the lowly graduate student cannot afford $350 on art. Would if I could, but can’t right now. The wife of the graduate student, who is the only one working, might furrow a brow over that. Who could blame her? Peterson and I talked about his work and how some classroom teachers have used it. He agreed to being interviewed by me at a later date for my thesis and for this blog. Incidentally, I am keeping a list of people – writers, illustrators, publishers, teachers, librarians and students – who are involved in using comics in the classroom, especially the elementary classroom. If you are a part of that process and are interested, please drop me a note, either a comment on the blog or an email. I would love to talk to you. I also talked to John Schuler. He is the illustrator for SUPER BILL & BUSTER. The interesting thing about Schuler is that he is also a middle school art teacher. So we talked shop for a bit, which was a lot of fun. He, too, agreed to a future interview for the thesis and this blog. As for photos, I took what I could without being intrusive or annoying. I did not take pictures of the creators that I talked to. In hindsight, I think I should have. It would have made for a better blog post, but at the time I did not want to be a bother. I did, however, get some shots of the place. I have Comic Life on my Mac, so I put the photos into that. If you want to see my photo comic montage, then you can click here to go to my personal photo site and check them out. Don’t bother emailing me to critique my comic layout. I just did it for fun. The table is set. I have made room reservations for Wizard World Chicago later this summer. I cannot wait to go. It sounds like so much fun. And the research opportunities! I can only imagine the creators and publishers I will be able to speak with out there. I giddy with anticipation. I'm a cartoonist and would love to help out or collaborate in some way. I draw the comic strip Quitting Time but can draw in a number of different styles including that of Archie comics (I trained with Dan Decarlo Jr. from Archie. ); please do check out my portfolio. Thank you for contacting me. I will send you an email.